The data are clear: Paper receipts coated in toxic chemicals pose risks to our health and have huge environmental impacts. That’s why Green America is advocating for a wider use of paperless solutions, while also ensuring recyclable, phenol-free paper will be used for customers who still request a paper receipt. Nearly every U.S. consumer handles a dozen paper receipts every week, and retail store employees may touch thousands in the same time. But few are aware of the toxic nature of the paper receipts, which utilize Bisphenol-A (BPA) or Bisphenol-S (BPS). Even fewer know of the major environmental and climate harms linked to the receipts, which are an easily avoided now that non-BPA receipts and digital sales confirmations are readily available, according to a new report from Green America. Only one-third of retailers have adopted digital options, and the vast majority of retailers issuing paper-based receipts continue to use papers with BPA or BPS coatings. Among the leaders identified in the report as having moved away from BPA/BPS receipts are Apple, Best Buy, GNC Live Well and Lidl Grocery. Laggards cited in the report as still using traditional paper receipts are Family Dollar, Petco, Target, TJ Maxx/Marshalls, Walgreens and Walmart. 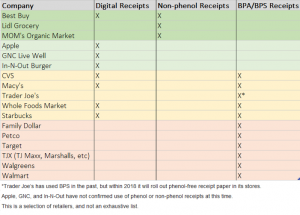 The report also finds that several companies, including CVS and Whole Foods offer digital receipts, but primarily give customers BPA or BPS receipts. An estimated 93 percent of paper receipts are coated with Bisphenol-A (BPA) or Bisphenol-S (BPS), known endocrine-disruptors. Paper receipts coated with BPA contain between 0.8 to nearly 3 percent pure BPA by weight. The total mass of BPA on a receipt is 250 to 1,000 times greater than the amount of BPA found in a can of food or baby formula, or in plastic baby bottles. Retail employees are at the greatest risk, as studies show workers who have regular contact with receipts have over 30 percent more BPA or BPS found in their bodies, and many employees may exceed the European Union’s limit for safe amount of BPA to absorb in a day. In the United States, paper receipt production uses an estimated 12.4 million trees, 13.2 billion gallons of water, and emits 4 billion pounds of CO2 each year. If just one company as large as Walgreens – with nearly six million customers every day – ends the use of paper receipts, over 55,000 trees and 58.8 million gallons of water are saved, and 17.6 million pounds of CO2 will be prevented from entering the atmosphere. [calculations by the Paper Calculator v 3.2.1. Digital receipts provide a relatively low environmental impact. Each e-receipt is estimated to have a footprint of 4 grams of carbon dioxide. Since a mature tree can absorb roughly 21,772 grams of carbon dioxide each year, by keeping trees in the forests rather than using them for paper receipts, one tree can accommodate the emissions of over 5,443 digital receipt emails. The Skip the Slip report highlights cost-effective digital and non-toxic solutions for retailers to protect their employees and customers, and reduce their impacts on the environment, while reducing fraud and increasing sales. It finds that Walmart, Walgreens, Target and Petco are among the retail laggards, while Apple and Best Buy are taking steps to be leaders. A related infographic highlighting the costs of paper-based receipts coated in BPA and BPS is available https://www.greenamerica.org/report-skip-the-slip. Consumers and employees who are concerned about the impacts of paper-based receipts and associated toxins can take action to encourage retailers to move to digital and non-toxic options here.